When you update a database record with the entity values, the database values are overwritten by the entity values (default behavior). In a real world situation it is quite possible that database values might have got changed after selecting them for modification. In such cases, your update operation might be overwriting changes made by someone else. That is why it becomes important to detect if concurrency violation has occurred. You can then take some corrective action or at least inform the user about such a violation. To that end this article shows how to detect concurrency violation in EF and also the possible ways to deal with the situation. As you can see the Concurrency Mode is changed from None to Fixed. Changing this setting will cause EF to use the UpdateToken column in the WHERE clause of the UPDATE queries it generates. This way a row is updated only when value of UpdateToken at the time of initial fetch matches with the current value in the database. If they don't match no record is updated and EF concludes that there was a concurrency violation. You can also detect a concurrency violation without using rowversion column. In that case you need to set ConcurrencyMode for each property that you wish to include in the WHERE clause. Using rowversion column simplifies your job and the resultant query. In order to bind this DetailsView with EF data model you need to write two methods in the code behind - DetailsView1_GetItems() and DetailsView1_UpdateItem(). 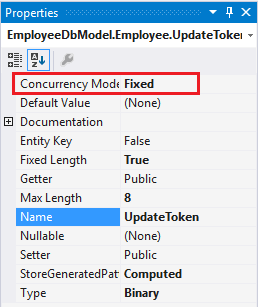 The former method returns all the Employee objects from the Employees DbSet as IQueryable whereas the later method updates employee details back to the database. Below the DetailsView place a Label (not shown in the figure) to display the concurrency violation error. 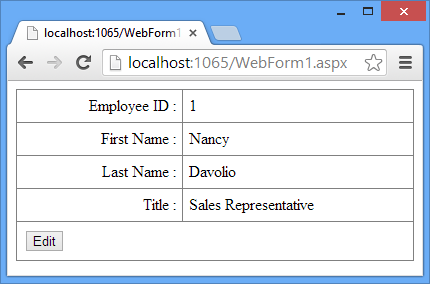 The DetailsView1_GetItems() method creates an instance of EmployeeDbEntities context. 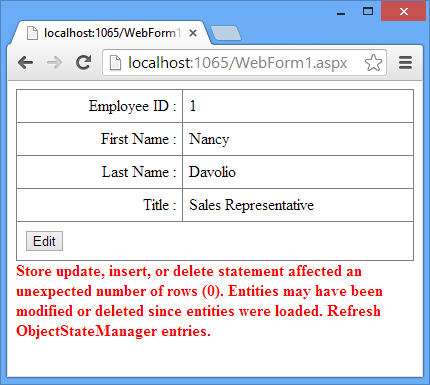 It then selects all Employee objects from Employees DbSet and returns them to the caller. The above code finds an existing Employee based on the EmployeeID. Remember that this EmployeeID is passed by the DetailsView only if DataKeyNames property is set. The TryUpdateModel() method then sets the properties of the existing Employee from the values entered in the DetailsView. The code then halts the execution for 15 seconds. This is done purely for the sake of testing. Adding this delay will allow you to switch to the physical database table and modify its data manually to test the concurrency violation. An alternative is to set a breakpoint at SaveChanges() method to halt the execution and then change the database values manually. The try...catch block is an important piece of code because it traps the concurrency violation error and displays it to the user. The try block attempts to save the changes back to the database by calling SaveChanges() method. If there are pending changes but SaveChanges() causes zero records to be updated it indicates a concurrency violation. If such a violation is detected EF throws DbUpdateConcurrencyException exception. The DbUpdateConcurrencyException class resides in System.Data.Entity.Infrastructure namespace. The catch block simply displays the error in the Label control. During the above test run you will find that after the error message is displayed to the user, the DetailsView shows the latest data from the database. You can test the same Web Form by adding the code for second and third approaches discussed above and verify whether it works as expected.